Geza Vermes is the greatest living Jesus scholar. In this collection of occasional pieces, he explores the world and the context in which Jesus of Nazareth lived and tells the story of the exploration of first-century Palestine by twentieth-century scholars. Informed by the work of a world-class scholar, the articles in this book open to the general reader the findings of some of the major discoveries of the twentieth century such as the Dead Sea Scrolls. This collection of shorter popular pieces, many of which appeared in The Times and other newspapers, makes Vermes' research on Christian origins, the Dead Sea Scrolls and most importantly Jesus the Jew accessible to a wider readership. 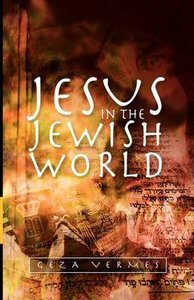 About "Jesus in the Jewish World"
Geza Vermes is one of the world's leading authorities on Judaism in the age of Jesus. His pioneering work on the Dead Sea Scrolls and the historical Jesus led to his appointment as a Christian as the first Professor of Jewish Studies at Oxford, where he is now Professor Emeritus. His Complete Dead Sea Scrolls,first published in 1962, since revised and edited, and now in its sixth printing,is widely considered a classic and foundational text. Since 1991, he has been the director of the Forum for Qumran Research at the Oxford Centre for Hebrew and Jewish Studies, and he was elected Fellow of the British Academy in 1985 and of the European Academy in 2001. Some of his published works include The Nativity, The Resurrection, The Authentic Gospel of Jesus, Jesus the Jew and The Passion.